Allergic contact dermatitis is a type of skin reaction that's triggered when the skin comes in contact with some foreign substance. Skin inflammation and hives are hallmark symptoms of allergic contact dermatitis because the body's immune system perceives the substance as toxic or pathogenic. Apple cider vinegar is a folk remedy most often used to improve digestion, although some anecdotal reports claim that consuming it or applying it to the skin is helpful for allergic reactions. Consult with your doctor or an allergy specialist if you experience recurring skin rashes. Allergic contact dermatitis is essentially a hypersensitivity reaction to environmental factors. It's caused by an allergen or a substance that provokes an immune response in your skin, which is different from an irritant that physically injures or damages your skin. Common triggers of allergic contact dermatitis include detergents, industrial cleaners, scented soaps, perfumes, heavy metals, synthetic fibers and food additives. The first sign of an allergic reaction is a skin rash or lesion at the site of exposure, according to the "Textbook of Functional Medicine." The itchy rash is often raised and develops pustules or blisters, which ooze and become crusty or scaly over time. Interestingly, an allergic contact dermatitis rash usually appears within a day or so of exposure, instead of immediately. Once you have developed an allergic reaction to a substance, it will likely trigger the same response with future exposures. Apple cider vinegar is made by fermenting the relatively unfiltered juice from tart red apples. Apple cider vinegar is especially rich in acetic acid, but it also contains malic, citric and ascorbic acids. As a folk remedy, it has a long history of use as a digestive aid and a source of vitamin C. Research has confirmed that it displays antioxidant and antimicrobial properties, according to the "Natural Standard Herb & Supplement Reference." In relation to allergic contact dermatitis, apple cider vinegar is usually rubbed into the inflamed skin, sometimes combined with honey. The purpose is to sanitize the area, reduce inflammation and stimulate healing, although no studies have confirmed its effectiveness. 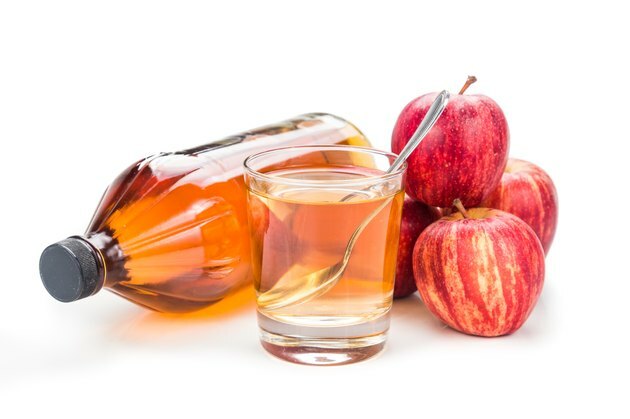 Furthermore, apple cider vinegar is sometimes recommended for internal consumption in order to combat allergic reactions, with the logic being that better digested food reduces the risk of immune reactions against undigested proteins. Whether poor digestion is related to allergic contact dermatitis is not yet known. Applying too much apple cider vinegar to inflamed skin may further irritate it because of the acidic nature of vinegar. Consequently, it may be a better idea to dilute the vinegar with purified water before applying it to a skin rash. Furthermore, be careful not to scratch the affected area while applying apple cider vinegar or any other remedy, as doing so will make the problem worse and possibly spread bacteria from any pustules. If the condition gets worse or doesn't improve after a week or so, contact a dermatologist. Once you know what's causing your allergic reaction, you should try to avoid the allergens, although learning about some home remedies can be helpful too. In addition to apple cider vinegar and honey, other natural compounds that can be applied safely to inflamed skin include aloe vera juice or gel, glycerine, warm salt water, cold tea bags and calendula gel. Can I Eat Oatmeal on a Candida Diet?